Getting charged with an OVI or DUI can be an overwhelming and complicated experience as an individual. Whether it’s your first offense or you’ve had previous offenses, it’s still just as difficult to navigate the complicated legal process of these types of charges. 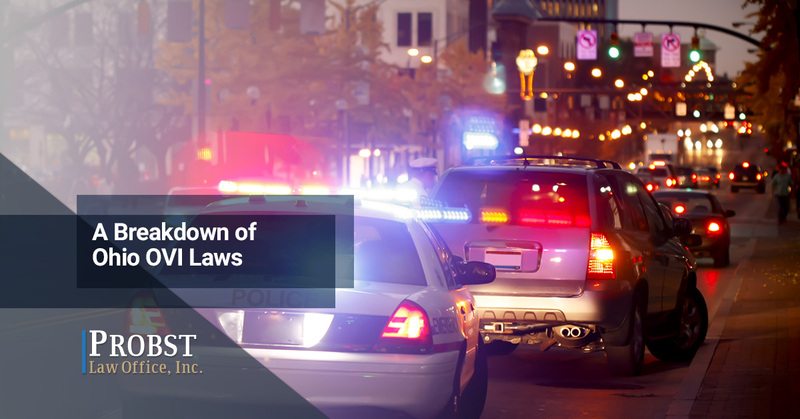 In today’s blog post, we’ll provide you with a short and sweet breakdown of Ohio’s OVI/DUI laws. At Probst Law Office, we offer several legal services for individuals in Columbus and surrounding communities. With more than 15 years of legal experience under his belt, our trusted DUI lawyer, Michael Probst, will always put your best interests first. Protect your freedom and your future, and contact one of Columbus’ most knowledgeable DUI attorneys today for a case evaluation. Not sure if you should hire a DUI lawyer for your case? Learn more about when you should here. What are the penalties for an OVI/DUI in Ohio? So, what exactly is an OVI/DUI? In Ohio, law enforcement officers primarily use the phrase “OVI” more so than “DUI”. OVI stands for “operating a vehicle under the influence”, which is essentially the same thing that is known in other states as a DUI (driving under the influence). If you get an OVI in Ohio, there are several penalties that are attached to this crime. Remember, DUI cases tend to be very circumstantial, meaning there are various factors during the time of your DUI that can weigh on your penalties — no DUI cases will be exactly the same. Anywhere between 3 days and 6 months of jail time. Fines that range between $250 to $1,000. A license suspension of 6 months to 3 years. For every offense after your first, the penalties severely worsen — for example, on your third offense, you are required to install an Interlock Ignition Device in your vehicle whereas this isn’t the case for your first offense. In Ohio, you have a 6-year “lookback period”, which is the period of time that prior OVIs of yours can still be relevant for sentencing. If you get pulled over and your BAC levels are higher than what is listed above, you will more than likely be charged with an OVI. How many drinks does it take to get to these levels? Check out this BAC chart from a trusted source. Did you or someone you love recently get a DUI in Ohio? Are you looking for a DUI lawyer in Columbus you can trust with your case? Look no further than Probst Law Office, where our DUI lawyer, Michael Probst, has effectively provided legal counsel for previous clients with DUI cases. You can schedule a legal consultation with our law office by calling (888) 223-3741 or by completing our form online.